Does Weight Gain Cause Skin Tags? There is no one specific reason for skin tags. They can be caused by a few different factors. Studies have however shown a strong correlation between weight gain and skin tags. Weight gain is also linked to a change in hormone levels. Understanding why weight gain and skin tags are linked can help prevent further growths and help you be more aware of any underlying health issues. Obesity leads to the development of adipose tissues, creating fatty deposits around the waistline and entire body. This build-up of fat not only makes you look bulkier but also creates significant changes in hormone levels. Insulin resistance by the body. This is a clear indication of the fact that the imbalance caused by hormonal secretion needs to be managed effectively as you might be inching closer to diabetes. When blood vessels and clusters of collagen get trapped inside thicker areas of skin, skin tags can form. They primarily develop on parts of the body where the skin experiences excessive rubbing or friction on a regular basis. Therefore, they are frequently seen to develop around the neck, underneath the breast, groin, and armpits. During pregnancy, women are likely to develop them as the additional hormones being produced for the pregnancy can result in skin tags growing. Weight gain and skin tags have a direct link due to the excess rubbing and friction caused by overlapping skin. Weight gain can also slow down your body’s metabolism. This deceleration of your metabolic rate will increase blood sugar levels. The pancreas then also secretes extra insulin. This increases your vulnerability to insulin resistance eventually leading to an imbalance in the secretion of other hormones by the body. Weight gain, diabetes, and hormone levels are all known to be factors in the development of skin tags. Individuals taking anabolic steroids are at an increased risk of developing skin tags. They cause a build-up of collagen allowing skin fibers to bond, resulting in the formation of skin tags. Weight gain is not only known to have an effect on insulin production, and blood pressure levels but also affects estrogen levels in men and testosterone levels in women. Testosterone is known to be responsible for masculine attributes and estrogen for feminine attributes. Substantial weight-gain can lead to excess secretion of estrogen and testosterone. This leads to the growth of a belly and breasts in men. 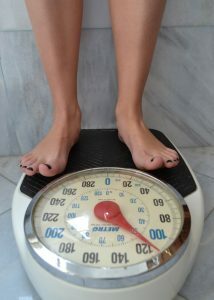 Women suffering from obesity may exhibit features like the growth of facial hair, baldness or hair loss and infertility. There are various treatments available to counter such hormonal imbalance or deficiency but it is always better to put a stop to such weight-gain so that the chances of developing skin tags are minimized, as well as helping with a myriad of other health disorders. There are rarely any medical complications associated with skin tags. It’s their protruding appearance is what usually makes people want to get rid of them. There are natural remedies, over-the-counter options and surgical treatments available for removing skin tags. Prevention is always better than cure though. Avoiding getting skin tags is, of course, preferred to removing them. When it comes to weight gain and skin tags, the best way to prevent the growth of further skin tags is to work on losing the extra weight that may be making it easier for skin tags to form. Because there is a strong correlation between obesity and diabetes and diabetes and skin tags, it is best to get them checked by your doctor if you discover skin tags growing rapidly.